In Pingyi County, the Shangdong Tianyu Museum of Nature which was opened in 2004 is devoted to dinosaur and other prehistoric fauna, applied for a Guinness World Record in early June and received the confirmation. "It contains 28,000 square meters (301,389 sq ft) of exhibition space, housing 1,106 dinosaur specimens and thousands of other ancient fossils," the London-based agency said in a certificate to confirm it as the world's largest dinosaur museum. The dinosaur specimens are all represented by almost complete skeletons, including 368 psittacosaurid specimens, 391 dromaeosaurid specimens, 255 Anchiornis specimens, 22 Jeholosaurus specimens, and 70 other rare dinosaurs and unnamed dinosaur fossils . 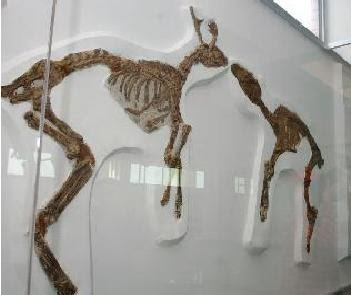 Before the new record, the museum had five other world records, including the longest silicified wood fossil, the biggest Sinosauropteryx fossil, the biggest amethyst cave, Yin said. A ceremony to mark the recognition as the world's largest dinosaur museum will be held on Sept. 28 at Tianyu, and officials from Guinness World Records headquarters would attend, Yin said.